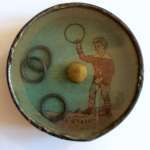 Antique Dexterity Games: Boy playing with rings. You try to place his rings right. ca 1910-20. Across 5 cm. ( 2") .Dexterity puzzles - also known as palm puzzles - have been a source of fascination for adults and children since the Nineteenth Century. Slighly signs of wear. 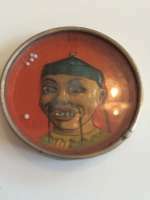 Antique Dexterity Games: Embossed Tin Chinese where you try to place his 4 pearl teeth right. ca 1890. Across 5 cm. ( 2") .Dexterity puzzles - also known as palm puzzles - have been a source of fascination for adults and children since the Nineteenth Century. Antique Dexterity Games: Valentine game. One game at each side Ca 1950 where you try to place the ring on the loved ones finger. Across 7 cm. ( 2 1/2") . Dexterity puzzles - also known as palm puzzles - have been a source of fascination for adults and children since the Nineteenth Century. 35 cm x 27 cm. Antikes französisches Lotto-Spiel, ca. 1870. Die Fragen sind aus den Kategorien Kunst, Geografie und Geschichte. Diese wunderschöne Original-Schachtel (Rot mit Golddruck) beinhaltet 24 handkolorierte Karten in wunderschönen Farben mit Dresdner Papier-Besatz. Hölzerne Spielsteine in der Original-Schachtel, Spielanleitung. Alles wunderbar erhalten. Fragen Sie bei Interesse nach mehr Details..